UPDATED 5 JAN 09 with a photo, hyperlink and a citation of a third guy, Shane McAllister. MY WEEKEND NEWSPAPERS tell me that I should be continue watching two guys who feature in my regular flow of online activities. The Limerick Leader fingers Patrick Collison (at left, seated in the centre) and The Irish Times cites Aodhan Cullen. Patrick has shared entrepreneurial ideas at Limerick Open Coffee on the heels of selling his start-up Auctomatic. Aodhan's Statcounter powers the stats package behind my blogs. The Irish Times says, "At the age of 28 Aodhan Cullen is already a seasoned technology entrepreneur. At 12 he started his first business typing CVs for his Dublin neighbours and at 18 founded Statcounter.com, a free advertising-supported service that boasts over two million members and generated a profit of €750,000 last year. It allows websites to track the number of visitors they attract and other important data such as how they found it. Statcounter, which Cullen runs with his wife Jenni, is totally self-funded and has been rebuffing approaches from US investors. After investing heavily this year, 2009 will see them competing with the big boys." 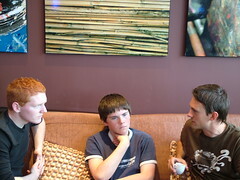 "A teenage entrepreneur who is studying for his Leaving Cert at Castletroy College is certainly one to watch in 2009. "John Collison made headlines after selling his software company Auctomatic, which he founded with his brother, Patrick, for three million euro in 2008. "The 18-year-old also managed to fit in the Science Olympiad while maintaining focus on the State exams. "He possesses an uncanny ability to pick up new technologies which played a vital role in making Auctomatic a success. "John aims high and flies high. He is a student pilot who has amassed over 40 hours flying time. "The whiz kid has revealed that once he has sat the Leaving Cert, he will join his brother in California where he hopes to pursue his studies at either Massachusetts Institute of Technology or Stanford. "The Collison brothers wre named in a rich list of young Irish people on a TV programme broadcast over Christmas on RTE. "The self-made millionaire will undoubtedly achieve top marks in his Leaving Cert this year, but watch out for an archive which he is currently working on for deleted Wikipedia content." If you find yourself at a big event in 2009 and get a text advising you of what's going on around you, chances are it has come from a Limerick firm. Next year looks set to be huge for Shane McAllister, the founder of Mobanode, which is currently based in the Enterprise Acceleration Centre at the Limerick Institute of Technology. The firm, which Shane set up in 2007, provides free mobile content at festivals, and other public events. Already in 2008, Shane has secured contracts with Heineken and as a result has provided mobile content at the Green Energy Weekend, as well as Electric Picnic. And catering for a different audience completely, he has provided simialr content for the Top Gear show, which took place at Dublin's RDS in November. On a local scale, Shane also provides mobile content for thrill-seeking students at the University of Limerick. Shane is paid by the sponsor of the event to provide the mobile content, and to this end, he provides ring tones and maps among other things for free to mobile users. Shane's turnover looks to be heading close on €100,000 this year. But Shane--who has received High Potential Start-up Funding from Enterprise Ireland and the National Development Plan--says it is festivals where he finds his niche. "We know why people are there, and as a result, we are able to send them relevant content on their mobile for free. For example, at festivals, we would be sending out maps of the festival sites, guides, schedules and MP3 downloads of bands that are playing," he explained. Next year, Shane says he hopes to "build on the success" he has had in the Irish market, and break into the UK market. He said: "At the end of the first week in January, I am going to be meeting with contact in the UK to hopefully repeat the success I have had here in Ireland, in particular looking at colleges and universities." And to this end, his one-man operation will double when he takes on another full time member of staff early next year. 1. News Features -- "The People to Watch in the New Year" in The Irish Times, 3 January 2009. 2. Petula Martyn on John Collison in "Which Limerick natives will shine in '09?" in The Limerick Leader, 3 January 2009. 3. Nick Rabbitts on Shane McAllister in "Which Limerick natives will shine in '09?" in The Limerick Leader, 3 January 2009.